Britain considers Vietnam an important trading partner in the coming years, British Secretary of State for International Trade Liam Fox has confirmed. Fox told reporters in HCMC last Friday that despite last June's vote to leave the European Union (EU), Britain will continue to pursue a liberal trade policy. Fox was optimistic about his country for the post-Brexit era, as more than 90% of its trading partners are outside Europe. He said Brexit would make it easier for Britain to strengthen ties, particularly those in trade with partners, and Britain would maintain good partnerships with European countries. Britain attaches importance to expanding trade with Vietnam, which is evident in Fox’s trips to Singapore and Vietnam as the first countries he had visited in Southeast Asia after he took up the new position. Fox said Vietnam was holding much potential and that the governments of Britain and Vietnam were sharing a view of trade liberalization. Fox stressed Britain would implement the EU-Vietnam Free Trade Agreement (EVFTA) when the Brexit process has not been completed. After the completion, Britain will look to a bilateral free trade deal with Vietnam to cash in on trade and investment opportunities awaiting the two countries. Vietnam ranked 38th among 241 countries and territories exporting products to the UK in 2015 and 25th among 233 countries and territories last year. Two-way trade between the two countries stood at US$5.6 billion in 2016 and the two sides expected to double it by 2020 at a meeting between Vietnam’s Prime Minister Nguyen Xuan Phuc and Fox in Hanoi last Thursday. British firms have got involved in multiple sectors in Vietnam, especially education and infrastructure development. Two companies from the European country have offered design and consulting services for Vietnam’s tallest building, Landmark 81, in HCMC. Fox said more British businesses would be encouraged to explore investment and cooperation opportunities in the technology, financial, pharmaceutical sectors in Vietnam, among others. He said Britain would use its expertise to support HCMC to become a smart city. Enterprises in Bình Dương’s southern industrial hub are seeking 22,700 workers to participate in a job fair held on Sunday. Thanks to its improved investment environment, Bình Dương has attracted $25.7 billion in foreign investment, with $2.4 billion in 2016 alone. Thirty-three Vietnam agricultural businesses are showing their products at the on-going Gulfood fair taking place on February 26 – March 2 in Dubai, the UAE. Gulfood Dubai is the world largest agricultural, food, and drink show. This year event draws the participation of 5,000 businesses who are displaying their products on 120 national pavilions and expects to receive 95,000 business visitors from 170 countries in the world. The participating Vietnam businesses include firms that gained credibility at previous Gulfood fairs like Vinamilk, Hapro and Lotus Rice and those which joined the fair for the first time such as Vinamit and VinEco. Showcased at the event is a wide range of products including rice, coffee, pepper, tea, cashew nut, spices, and medicinal herbs as well as processed products such as milk, fruit juice, canned food and food supplements. A satellite of Samsung, the Davo C&M Co. Ltd. has signed a contract with Viglacera to rent 20,000sq.m land at Phu Ha Industrial Park in Phu Tho province to build an electronic component plant. This is the fifth businesses from the Republic of Korea to invest in the IP. Earlier other Samsung satellites like Jawa Vina, NT Vina, Almus Corp, and Elpostech chose Phu Ha IP as their destinations. Thus, Phu Ha IZ has so far attracted five Korean and two Japanese businesses which rent a total of 20ha of land. Covering 350ha, Phu Ha IP is invested by Viglacera with a total construction cost of VND1,730 billion. With abundant and low-cost labour force, convenient transport, Phu Ha has become an attractive destination for many investors in electronics, especially Samsung satellite companies. The Republic of Korea (RoK) surpassed the United Arab Emirates (UAE) to become the biggest importer of telephones and components from Vietnam in January, with revenue of nearly 230 million USD, a year-on-year surge of 107.7 percent. According to the General Department of Vietnam Customs, Vietnam shipped telephones to 37 countries and territories in January. Vietnam’s telephone exports to the UAE fell from 365 million USD in January 2016 to 228.5 million USD this January, representing a decline of 37.4 percent. At the end of January 2017, telephones and components remain the leading export product of Vietnam with total turnover of 2.3 billion USD, rising 2.6 percent compared to the same period last year. Aside from the RoK and the UAE, major markets of Vietnam’s telephones in January include the US (with 206.8 million of turnover), Austria (163.3 million USD), Italy (144.8 million USD) and Hong Kong, China (112.3 million USD). The export value of agricultural, forestry and fishery products is estimated to see a year-on-year increase of 1.4 percent to 4.3 billion USD in the first two months of 2017. The value in February alone is estimated at 1.9 billion USD, according to the Ministry of Agriculture and Rural Development. Major farm products saw a year-on-year increase of 8.8 percent to 2.4 billion USD thanks mostly to a surge in coffee export, while seafood export value hit 844 million USD, down 3.1 percent from the same period last year. Meanwhile, the forestry industry saw a slight increase of 0.3 percent in export value to 993 million USD in February. In the first two months, coffee exports decreased by 7.3 percent in volume to 273,000 tonnes but went up 22.3 percent in value to 616 million USD compared with the same period last year. Rice exports plummeted in both volume and value. Shipments dropped by 17.2 percent in volume to 799,000 tonnes and by 40.6 percent in value to 248 million USD against the same period last year. Similar drops were witnessed in other farming products, such as tea, cashew nuts, pepper; falling 6.9 percent, 12 percent, and 36.3 percent, respectively in export value; and 1.4 percent, 26.2 percent, and 19.8 percent, respectively in volume. Canada will soon provide an aid package of about 15 million CAD (11.3 million USD) for a food safety project in Vietnam. Canadian Minister of Agriculture and Agri-Food Lawrence MacAulay made the announcement at a working session with Vietnamese Minister of Agriculture and Rural Development Nguyen Xuan Cuong in Hanoi on February 27. Minister Cuong said the trade potential between Vietnam and Canada is enormous. Goods shipped between the two countries are supplementary, which helps propel bilateral economic ties forward, he said. He urged the two sides to help businesses promote investment and develop farm produce markets. Canada mainly exports seafood, wheat flour, soybeans, beef, pork, fruit, and cattle-feed material to Vietnam. Minister MacAulay emphasised boosting exports of lobsters, blueberry, and pork to the Southeast Asian country. Minister Cuong said Vietnam wants to import high-quality pork. The country’s aquatic industry is also developing, hence, Canada could study breeding lobsters in Vietnam for sale in the country and for export. Vietnam is a leading trade partner of Canada among the 10 ASEAN countries, he said, adding that agri-food and seafood play a crucial role in exports to Canada. Last year, Vietnam exported 2.65 billion USD worth of goods to Canada, and imported 389.9 million USD, he said. The Canadian government helped the Vietnamese Ministry of Agriculture and Rural Development implement a project building quality farm produce worth 17 million CAD (12.8 million USD) between 2008 and 2014, and another providing technical and policy assistance to restructure the agricultural sector at a total cost of 500,000 CAD (379,000 USD) which concluded in December 2016. Dung Quat Refinery in the central province of Quang Ngai is aiming to decrease its turnover by 17 percent this year, a 2017 target of 62.4 trillion VND (2.77 billion USD). Its 2017 profits are forecasted to plunge 66 percent from 2016 to 1.68 trillion VND. The refinery plans not to export oil this year, while its exports in 2016 earned 28 million USD. Additionally, the firm is expected to invest an additional 2 trillion VND and contribute 7.2 trillion VND to the State budget, a 5.2 trillion VND reduction from the previous year. The State-owned Binh Son Refining and Petrochemical Company (BSR), an affiliate of the Vietnam National Oil and Gas Group (PetroVietnam)--which operates the 3 billion USD refinery--has announced its approved production, business and investment plans in the 2016-20 period. Its total expected turnover in the five year period was 573.7 trillion VND, with average turnover of 114.7 trillion VND a year. It yielded oil prices of 90 USD per barrel. BSR said they set the modest targets, despite high growth last year, because they foresee an expected drop in crude oil prices and a shorter production time. Last year, its turnover was around 75.2 trillion VND, while its profit was more than 5 trillion VND. It contributed 12.4 trillion VND to the State budget. In 2016, it spent more than 1 trillion VND on its investments, spending 1.4 times more than the previous year. Tran Ngoc Nguyen, BSR’s general director, told media that the set targets are based on the speculative oil price of 50 USD per barrel. In addition, the refinery will halt its operation within 52 days for its third overall maintenance in the middle of the year. However, we should strive for higher results than the set targets, as the oil prices have increased in the world market. The maintenance is also expected to be shorter than the scheduled plans, he added. BSR also aims to maximise its operation and production to reduce costs, increasing effectiveness. It has striven to bring its total yearly capacity to 98 percent, with a total output of 5.8 million tonnes. The refinery meets around a third of Vietnam’s demand for fuel and oil products. It reported that last year, its average salary and bonuses for leaders were 38.8 million VND a month, a sharp decrease from 44.9 million VND in 2015. It has proposed the Ministry of Labour, Invalids and Social Affairs consider applying its special mechanism for managerial salaries at companies with annual turnover over 100 trillion VND. Vietcombank has set itself a target of 18 percent credit growth this year and pre-tax profit of 9.2 trillion VND (over 405 million USD). Agribank hopes to achieve 14-18 percent credit growth and at least 10 percent profit. Private banks too expect credit growth to be higher this year than last year, thus boosting profits. For instance, ACB targets 18 percent expansion. This was because for a long time banks’ profits have relied mainly on credit, particularly in the case of small banks. In fact, for many small banks, 80-90 percent of profits come from credit-related activities. Many economic sectors are forecast to recover strongly this year, possibly giving banks’ lending plans a boost. But analysts are unsure, saying stepping up lending is not an easy task. A central bank official said this year bank lending would be closely controlled, especially long- and medium-term loans to high-risk customers, including those involved in property and in build-operate-transfer and build-transfer transport projects. The central bank will also focus on improving credit quality and lending to businesses in priority sectors, meaning banks will not have many opportunities for high credit growth. A member of the Advisory Council on National Financial and Monetary Policies also said achieving high credit growth this year would be a challenge. To expand credit, it is necessary to further cut interest rates, particularly on medium- and long-medium loans, but it is not an easy task because costs continue to rise due to high deposit interest rates, he said. Authorities of the central coastal province of Khanh Hoa province has introduced representatives from the US and Russian economies to the locality’s potential and strengths, especially in sea-based economy. Meeting with Matthew J. Matthews, head of the US delegation, in Nha Trang city on February 27 on the sidelines of the first APEC Senior Officials Meeting (SOM-1) and related meetings, Le Duc Vinh, Chairman of the provincial People’s Committee, said that the US’s investment in Khanh Hoa remains modest with only one project worth 2.7 million USD while about 30,000 American tourists visit the province each year. The local leader wished that more and more businesses from the US will come to seek investment opportunities in Khanh Hoa, particularly in Van Phong Bay economic zone, adding that the province encourages investment in such fields as hi-tech, education and petrochemistry. He also emphasised the need for the two sides to enhance collaboration to make Nha Trang city more attractive to Americans. At a meeting with Valery E. Sorokin, a senior official from Russia, Vinh spoke highly of the current comprehensive strategic partnership between Vietnam and Russia, saying that thanks to direct air routes from Russia to Khanh Hoa, the number of Russian tourists to the city hit over 300,000 each year. However, the two sides’ trade and investment cooperation is still yet to match their potential and expectations, he said, noting that Khanh Hoa is calling for investment in such areas as petrochemistry, shipbuilding, equipment manufacturing and seafood processing. The US and Russian representatives said their economies will take measures to enhance cooperation with Khanh Hoa and encourage their businesses to invest in the locality. This week, the Khanh Hoa authorities plan to hold more meetings with representatives from APEC economies attending the SOM-1 and related meetings. Deputy Minister of Industry and Trade Cao Quoc Hung has suggested India back four ASEAN members, namely Cambodia, Laos, Myanmar and Vietnam (CLMV), via its investment in manufacturing, services, infrastructure, inter-regional trade, technical training and capacity improvement. Hung updated participants about Vietnam’s economy and its integration into the world over the past years as well as ties between Vietnam and India. In order to push forward the sustainable development of Vietnam-India, and India-CLMV economic and trade links, Hung suggested strengthening bilateral transport connectivity and trade-services liberalisation, further enhancing cooperation within the ASEAN-India framework via establishing ASEAN-India trade and investment centre, continuing India-CLMV collaboration as part of a 100-million-USD credit package that India has committed to CLMV, identifying specific cooperative areas and increasing the sharing of experience in State management, exchange of experts and training. Minister of State for the Indian Ministry of Commerce and Industry Nirmalan Sitharaman, for her part, said ASEAN is one of the pillars in the “Act East” policy of India and bilateral ties with CLMV are appreciated, especially in engineering, renewable energy, agriculture and skill development. She said Vietnam and India hold great potential of collaboration in diverse areas, including in garment, farm produce and pharmaceuticals. The host highlighted India’s strength in engineering and garment and affirmed that the forum provides businesses a chance to seek partnership and investment opportunities. The two-day conclave, co-hosted by the Confederation of Indian Industry and the Indian Ministry of Commerce and Industry, focused its discussions on engineering, construction, agro- fisheries and related sectors, skill development, energy conservation, renewable energy and electricity. It also featured three sessions on cooperation with Cambodia, Myanmar and Vietnam. Techcom Vietnam Real Estate Investment Trust (TC REIT) has become the first of its kind to be listed and traded on the Hochiminh Stock Exchange (HOSE). The reference price on the first trading day, February 27, was 10,000 VND per fund certificate with a /- 20 percent trading band. HOSE Deputy General Director Le Hai Tra said TC REIT (stock code FUCVREIT) has a charter capital of 50 billion VND (nearly 2.2 million USD), equivalent to 5 million fund certificates. It is managed by the Techcom Capital Co. Ltd and supervised by the Ha Thanh branch of the Bank for Investment and Development of Vietnam (BIDV). Many insiders said the listing of TC REIT on the HOSE provides a chance for both domestic and foreign investors to own part of potential property projects and gain routine and stable income without spending much money on purchasing that property. By joining the stock market, the investment trust will also receive more public attention which in turn will help promote its transparency and protect investors’ interests, they said. The fund is going to increase its charter capital to meet the investment demand in the near future, according to Le Thi Tuyet Hang – a representative of TC REIT. The southern economic hub of Ho Chi Minh City lured 443.1 million USD in foreign direct investment (FDI) in the first two months of 2017, a year-on-year rise of 61.3 percent. The statistics were revealed at a meeting of the municipal People’s Committee on February 27. Director of the municipal Department of Planning and Investment Su Ngoc Anh said in February alone, the city licensed 96 new projects capitalised at 119.1 million USD, and allowed 24 existing ones to increase investment with a combined added capital of 59.7 million USD. FDI mainly went to such fields as information and communication (50.5 million USD); automobile and motorbike (31.92 million USD); and processing and manufacturing (10.34 million USD). Malaysia topped the list of investors with 44.24 million USD or 37.2 percent of total investment, followed by Japan (24.34 million USD), and the Netherlands (16 million USD). In January – February, the city had 4,404 newly-established businesses with a total registered capital of over 57 trillion VND (2.6 billion USD), a year-on-year increase of 11 percent in number and 100 percent in registered capital. The new firms are mainly operating in real estate, automobile and motorbike, and construction. To attract more investment, the municipal People’s Committee will continue taking measures to support businesses and improve investment climate while holding meetings between local authorities and foreign-invested businesses. The city will also help enterprises to increase productivity and product quality as well as establish a startup ecosystem and expand overseas markets. Cooperation potential between Vietnam and Lithuania remains extensive, particularly in agriculture, IT, education and tourism, stated Lithuanian Ambassador to Vietnam Ina Marciulionyte. The diplomat made the statement at a conference to promote partnerships between the sides held in Ho Chi Minh City on February 27. As bilateral trade has fallen short of potential, Lithuania wants to boost economic ties with Vietnam in the coming times via a range of conferences and trade connection programmes, she noted. She said her country is lacking human resources in the IT sector and is willing to issue long-term work permits for eligible Vietnamese workers. Lithuanian agricultural attaché Mindaugas Kuklierius said his country boasts strengths in the production of meat, milk products, and baking materials. He added that his country wants to import Vietnamese fruits, vegetables and catfish products. A representative from the Tan Dai Duong company, which has been importing chicken meat from Lithuania, said demand for importing Lithuanian goods into Vietnam has been hindered by restricted information about the northeast European country. Nguyen The Kien, head of the SaigonStar company, noted that products from Vietnam and other Southeast Asian countries are hardly found in the Lithuanian market, which has small demand but is a gateway to the European market. Once the Vietnam – EU Free Trade Agreement takes effect, tremendous trade and investment opportunities will be opened up for both sides, Kien stressed. An investment, trade and tourism promotion conference held by Tuyen Quang Province on February 27 has ended with investors’ commitments to pour a total 18.3 trillion VND (over 801 million USD) into six projects in this northern mountainous province. The provincial authorities also took the occasion to present licences to six projects worth a combined nearly 3.7 trillion VND (164 million USD), including a 900 billion VND resort by Vinpearl group, and a 485 billion VND animal breeding complex by Dabaco. At the conference, the first of its kind held by Tuyen Quang, Prime Minister Nguyen Xuan Phuc said the planned construction of a 40-km road connecting Tuyen Quang with the Hanoi-Lao Cai expressway will help reduce the travel time between the locality and Hanoi as well as other key economic areas in the north. He urged the local authorities to pay attention to developing spearhead economic sectors such as organic agriculture, tourism, forestry, and mining, affirming that that these will help Tuyen Quang lure more investors. The PM asked the locality to continue with efforts to improve investment climate through simplifying administrative procedures, increasing investment in infrastructure development, protecting the environment, and ensuring political stability, security and social order, as well as enhancing labour training. He express his hope that investors build long-term business strategies in the province and ensure workers’ rights and interests, while paying special heed to protecting the environment, especially the water environment. The Government leader reiterated the government’s resolve to ensure stable macroeconomic and investment environment for businesses. Tuyen Quang is calling for investment in the fields of tourism, agro-forestry-aquaculture production and processing, forest plantation and protection, and production of biotechnological products. So far, the province has granted investment licences to 180 projects with a total investment of over 27 trillion VND (about 1.18 billion USD), including four foreign-invested projects. I 2016, several big economic groups like the Vingroup, the Muong Thanh Group, the Vietnam National Textileand Garment Group and the DABACO Group, chose Tuyen Quang for their investment. The Asia-Pacific Economic Cooperation Forum (APEC) 2017 in Vietnam is a golden opportunity for local enterprises to promote trade and investment, according to Hoang Van Dung, Chairman of the APEC 2017 Business Advisory Council. Dung said APEC is a leading economic forum and drives growth, trade and investment in the region. The forum, which includes the world’s economic largest economies like the United States, Japan and China, contributes 50 percent of global GDP and 50 percent of global trade. For Vietnam, APEC member economies contribute up to 70 percent of investment and tourism growth with 20,000 enterprises registering a total capital of 300 billion USD, contributing 25 percent of GDP, 35 percent of industrial output and 70 percent of export value. They also provide one million direct and indirect jobs in Vietnam and are turning Vietnam from an agricultural economy into an export-oriented and manufacturing economy. Dung said at the forum, Vietnamese enterprises can contact leading enterprises in technology to seek technologies suitable for their development. Vietnamese enterprises can also participate, contribute and raise issues at the APEC Business Summit, the APEC Economic Leader's Meeting, the APEC Business Advisory Council, and public-private dialogues between APEC working groups and businesses. According to Dung, micro-, small- and medium-sized enterprises must improve their capability by restructuring business and taking advantage of technology to boost productivity and competitiveness if they are to go global. Import-export turnover through Mong Cai city, which is a border economic zone in the northern coastal province of Quang Ninh, hit more than 1.8 billion USD in the first month of 2016, representing a year-on-year increase of 169.7 percent. The value of exports going through the border gate in the period reached 855 million USD, up 186.1 percent against January last year, Vice Chairman of the Mong Cai city People’s Committee Nguyen Tien Dung was quoted as saying by Cong Thuong (Industry and Trade) newspaper. The Mong Cai border gate’s customs section said the agency approved 2,806 customs declarations from export and import enterprises from January 1 – February 4, with a total value of 2.9 billion USD, collecting 45.66 billion VND (over 2 million USD) for the State budget. Minh Thang port under the Minh Thang Co., Ltd was put into operation on January 29, carrying out customs clearances for about 20 containers per day. The Thanh Dat Inland Container Depot also witnessed bustling activities in January. 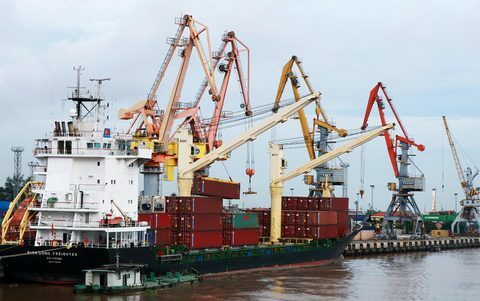 Deputy Director of the port Thanh Dat said about 50-60 containers were cleared by customs at the port per day. Nguyen Tien Dung said municipal authorities have worked to fully exploit the locality’s strengths of border-gate economy, contributing to changing the local economic structure. The city has also held dialogues with enterprises and investors in the locality with the aim of timely addressing difficulties facing them. Vo Hong Chung, deputy head of the Mong Cai border gate’s customs section said his agency is willing to work around the clock for customs clearance at the gate. To develop Mong Cai into a modern international border gate city, municipal authorities are focusing efforts on key infrastructure projects, such as the Bac Luan 2 Bridge, and the upgrading and expansion of Bac Luan border gate 1. Administrative procedures were simplified while the time for customs clearance was shortened, helping reduce expenses for enterprises. All boutique hotels of Phu Quoc Waterfont that opened for sale on Saturday were sold out, making the beach-front hotel project a “phenomenon” in Phu Quoc Island’s resort and hospitality property market. Developer BIM Group and sale agent MGV said they received 150 bookings although just 59 coastal boutique hotels and 38 boutique hotel luxury units of Boutique Hotels Phu Quoc Waterfront were up for sale. “We can say Phu Quoc Waterfront has created scorching heat at the Jade Island today. Customer demand is so high that all units are sold out,” a representative from BIM Group said. Boutique Hotels Phu Quoc Waterfront is among the first mini-hotel projects on the island, which has been witnessing an impressive increase in the number of tourist arrivals every year, although room supply remained modest. The project is located in BIM Group’s complex Phu Quuc Marina where leading hospitality brands have gathered, such as IHG with InterContinental Hotel, which will be operational in August, and Regent Phu Quoc, which is going to start construction, and the Sailing Club. Phu Quoc Waterfront is also close to the marina square, the night market, bars, clubs and restaurants. A buyer from Ha Noi who is engaged in the hotel business in downtown Ha Noi said Phu Quoc Waterfront met the expectations of his family, which was seeking to expand the business. On Saturday, BIM Group and MGV also shared with interested buyers updates on the real estate market in Phu Quoc Island, especially the hospitality segment and its development potential. Techcom Viet Nam Real Estate Investment Trust (TCREIT) made debut on the HCM Stock Exchange (HOSE) on Monday under the code FUCVREIT at a par value of VND10,000 (44 US cents) per fund certificate. Five million FUCVREIT fund certificates were floated on the southern bourse, without a specific due term for the fund’s being traded. Changes in the due term will be decided by investors’ resolutions. HOSE said in a statement that this was also the first domestic-invested fund in Viet Nam’s securities market. The trust fund was founded by the Techcom Capital Co Ltd (TCC), an investment arm of Techcombank. Ending the first session, its price closed at VND12,000 apiece with 8,330 fund certificates exchanged. The investment trust was founded as a closed-end fund with initial capital of VND50 billion (US$2.22 million). The fund expects to increase its capital in the future to meet investors’ demands when targeting potential real-estate projects. By making investments in Techcom Capital’s property investment trust, domestic and overseas investors can indirectly own part of potential real-estate projects and receive constant earnings from those projects without spending money on direct investments in the projects. In addition, with the fund’s trading on HOSE, investors can buy and sell fund certificates more easily, compared to trading in a real-estate project. A REIT fund is founded by investors’ capital when they purchase fund certificates and authorise the fund management board to supervise their shares. A real estate investment fund often spends most of its net asset value (NAV) investing in real-estate projects and real-estate companies. The domestic real estate investment fund has a long-term investment strategy focusing on property projects, such as office buildings, hotels, resorts and shopping centres, which generate constant earnings for the fund from leasing and business activities. The fund will also consider making investments in projects, such as apartment buildings and housing, which are developed by reputable institutional developers and have high possibilities of price increases, to benefit from selling products in those projects. In Viet Nam, there are some foreign-invested real-estate investment trusts, such as Vinaland by the VinaCapital, VPF by the Dragon Capital and VPH by the Saigon Asset Management. These funds mobilise capital from overseas investors to purchase stakes in Viet Nam’s real-estate projects and property stocks, after which the funds will be listed on overseas stock exchanges. According to current regulations, of the total NAV, a REIT must spend at least 65 per cent investing in real-estate projects and property stocks and, at most, 35 per cent investing in other types of assets, such as deposits, bonds and securities. When the fund seeks capital via an initial public offering (IPO) and/or increases its capital, investors can purchase more fund certificates by making payments in cash or they can contribute their stakes in real-estate projects to receive the amount of certificates that are of equal value to the stakes in property projects. This could become a new tool to help investors offload their stakes from real-estate projects by selling their fund certificates, if the projects have low trading liquidity in the property market. Vertiv, formerly called Emerson Network Power, announced it was awarded the 2016 Asia Pacific Modular Data Center Customer Value Leadership Award by Frost & Sullivan on February 27. This recognition is given to organisations that have shown exemplary achievements within the industry, delivering the best value to customers in the modular data centre market. “With the speed in which technology today is growing and being utilised, integration of IT and communication assets is increasingly becoming important for organisations looking to reduce operational cost while ensuring they are delivering the best possible services to their customers,” Steve Shelley, vice president for modular solutions, Vertiv in Asia Pacific, said. Vertiv provides unified infrastructure solutions that are rapidly deployable, scalable and efficient for different critical applications. Its modular data centre solution showcases its unique collaborative design-build process, enabling a deployment time that is up to 50 per cent faster than traditional data centre designs. Vertiv’s modular data centre solution has been deployed in key infrastructure projects throughout the Asia Pacific, particularly in telecom applications in Australia, the Philippines and Myanmar. The inauguration of Cua Dai Bridge and the coastal route running from Duy Xuyen to Tam Ky in March last year brings many opportunities for businesses to invest in the central province of Quang Nam, and in Chu Lai Open Economic Zone in particular. With Cua Dai Bridge opening to traffic, Quang Nam authorities have recognised the great potential of connecting the dynamic city of Danang and ancient city of Hoi An to the east of Quang Nam and Chu Lai Open Economic Zone (EZ). This also offers a tremendous opportunity for the development of the province. Simultaneously, a series of social welfare programmes have been implemented, such as proposals to conduct training, transform livelihoods, and create more jobs for the locals, along with projects to renovate agricultural land and to build storm-resistant housing for residents. These have contributed to positive changes in the living standards of thousands of local families. More importantly, with the existing effort to lure more investors, Chu Lai EZ now has a new foundation to increase the quality of services for trade and investment projects into the zone. Over the first six months of 2016, the Chu Lai-Truong Hai automobile complex has put several projects into operation, including a heavyweight specialised vehicles and semi-trailers manufacturing factory, composite component factory, and mould manufacturing factory. In addition, the production capacity of the Kia Thaco plant will be raised from 28,000 to 30,000 cars; Vina Mazda’s production will also be bumped up, to 30,000 vehicles per annum. The complex will boost an automobile air conditioning factory capable of producing 50,000 units per year, and an exhaust pipe factory with a capacity of 100,000 products per year. Recognising the great trade opportunities afforded by the Cua Dai Bridge, Thaco has worked to expand its Chu Lai-Truong Hai complex, as well as two routes connecting Tam Hiep Port with the highway and industrial park (IP), in the Tam Hiep urban area. Thaco said that investment in routes to Cua Dai can help support Chu Lai EZ, as well as enhance the lives of the locals and attract more socio-economic investment. According to Do Xuan Dien, director of the Chu Lai Open Economic Zone Management Authority, 10 years ago, businesses hesitated to invest in Chu Lai EZ, doubting its ability to attract big projects, especially those in manufacturing and heavy industries. However, the zone has gained potential with the development of the surrounding areas, and Chu Lai is becoming a destination for several international-scale projects. To create more room for development to the east of Quang Nam and Chu Lai EZ, the Quang Nam People’s Committee has adjusted its master plan to allocate 1,500 hectares for future development. This increases the province’s total area for development space to 45,000ha, including Chu Lai EZ and the general project on residential arrangement along 25 coastal communes, wards, and towns. Dien added that the province has also announced six sectors that need improvement to develop the South Quang Nam and Chu Lai EZ. These include the development of the South Hoi An service centre and urban area; the auto industry and its supporting industries; the textile industry in line with the urban development of Tam Ky; clean industry development in line with Chu Lai Airport; gas and electricity projects and energy-using industries; and projects to upgrade fishing ports and anchorage areas. Dinh Van Thu, Chairman of the Quang Nam People’s Committee, said that these six sectors have been identified based on the existing potential and advantages of the province in terms of its location, infrastructure, and policies to attract domestic investment. These concentrations also reflect the development policies of Chu Lai EZ, which have been approved by the central government. The province now hosts several key projects playing an essential role in directing general development of the region, such as the South Hoi An project, Everland, Tam Thang IP (Tam Ky), an auto manufacturing factory at Tam Hiep IP (Nui Thanh), and a gas treatment plant and gas-electricity plant at Gas-Electricity IP of Tam Quang, Nui Thanh. The recent revelations of enterprises donating luxury vehicles to State agencies have aroused public concern, with many people perceiving this practice as an act of bribery. No law thus far has defined it as illegal, though. The prevailing rule only forbids individual officials from taking expensive gifts, which is a corrupt practice, while State agencies are not affected by this. As reported in local media weeks ago, an enterprise named Cong Ly had donated two Lexus sport utility vehicles (SUV) to Ca Mau Province with each costing VND3.1 billion. One is now used by Ca Mau Province’s People’s Committee, and the other by the provincial Party Committee. The case has caused controversy over the legitimacy of such donations. Soon later, the public concern was heightened when it was uncovered that the chief of the Party Committee of Danang City was using a VND1.3 billion sedan donated by an enterprise. Speaking to reporters, Danang City authorities say that State agencies in the city have received up to eight vehicles from corporate donors. The general director of Cong Ly in Ca Mau says that his company, before making the donation, learned from the Danang City case, indicating that a precedent had been established whereby other enterprises can use it to approach State agencies to seek a favor. Authorities from both Ca Mau Province and Danang City have asserted that all such donations have been treated in accordance with the law, and no special favors are given to donors in return. However, such explanations are not convincing. For instance, the media has cast doubt on a decision by Ca Mau to offer a VND25 billion loan to Cong Ly Company, wondering whether the lending may have been influenced by the company's generous donation. There was a case in which an enterprise donated a SUV to the Ministry of Transport years ago vexing the public. There have now emerged donations of expensive vehicles, let alone a high probability that other “gives-and-takes” have gone unreported. All such cases have to some extent eroded public confidence. Pending regulations governing such gives-and-takes, and given strong public reactions to such cases, State agencies should not accept vehicles or other costly items even for the sake of public administration, either under the form of donation or lending.